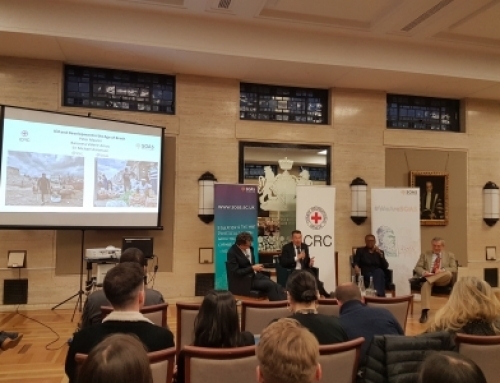 On Friday 23rd November 2018 the R4HC Programme hosted its UK Launch at the British Academy, London. 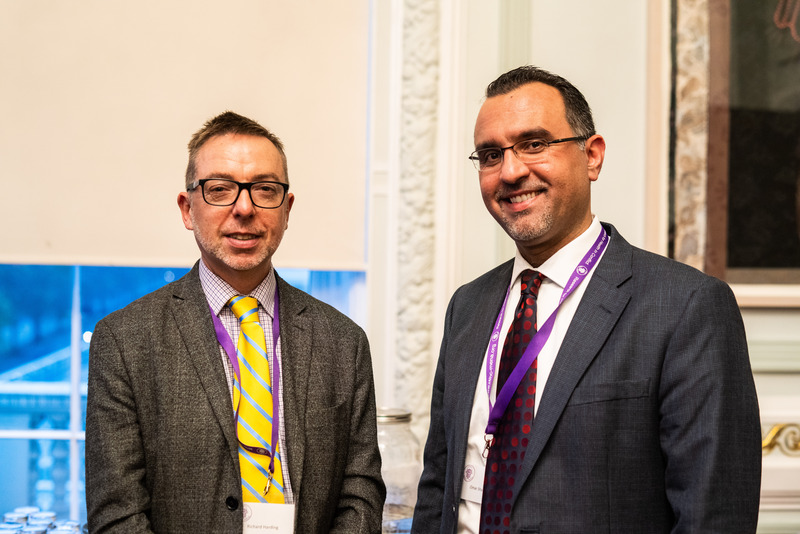 The launch brought together programme members, partners and stakeholders from across the UK and MENA regions to celebrate the programme’s achievements at the end of an exceptionally successful first year. R4HC-MENA is funded by a £6m UK Research & Innovation Global Challenges Research Fund Award. 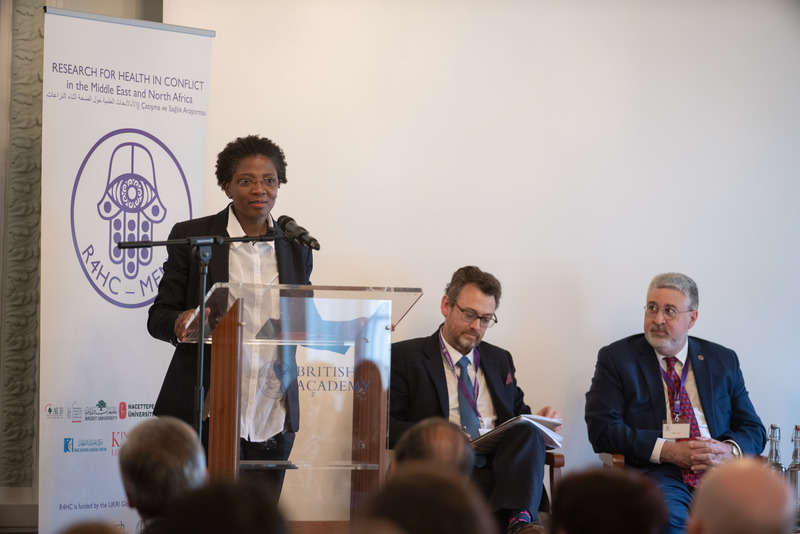 The programme works across four primary work streams: Conflict and Health; Mental Health in Conflict; Cancer and Palliative Care in Conflict; Political Economy of Health in Conflict. The vision for the R4HC partnership is to build sustainable research capacity in the region to address major health challenges arising from conflict, specifically cancer and mental health as key NCDs, and facilitate more effective translation of research into policy. The partnership focuses on local and refugee populations in Jordan, the Occupied Palestinian Territories, Lebanon and Turkey. R4HC-MENA Chair Professor Richard Sullivan (KCL) introduced a distinguished panel of speakers, including Professor ‘Funmi Olonisakin (KCL Vice-President, International) who delivered the keynote speech on the key components of a programme aimed at solving multi-dimensional challenges: producing and encouraging the transfer of knowledge; creating leadership opportunities; and building sustainable partnerships. 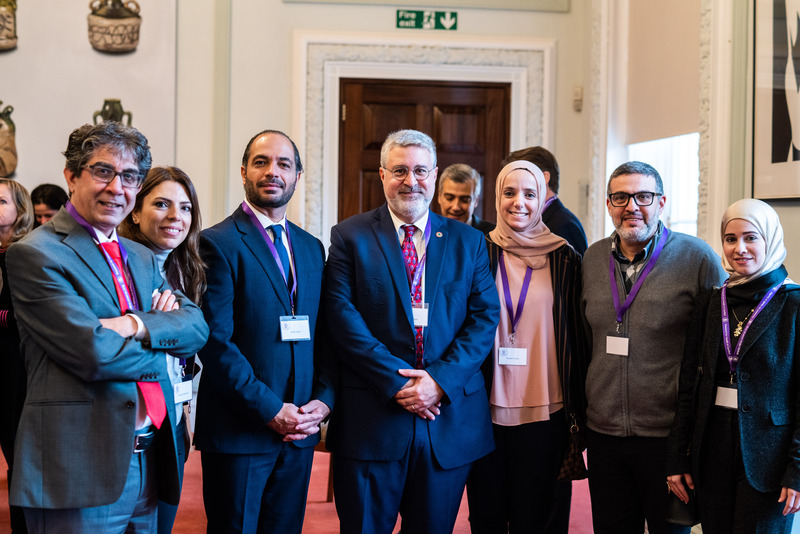 The panel of speakers also included Dr Fadlo Khuri, President of the American University of Beirut who described R4HC-MENA as a timely collaboration in an era of shared challenges that can only be met with strong partnerships and innovative programmes. Some of these shared challenges were emphasised by the third panellist, Dr Asem Mansour (CEO and Director General of the King Hussein Cancer Centre in Amman, Jordan) who discussed the high prevalence of risk factors for NCDs in the MENA region where many of the health systems are ill equipped to deal with these burdens. 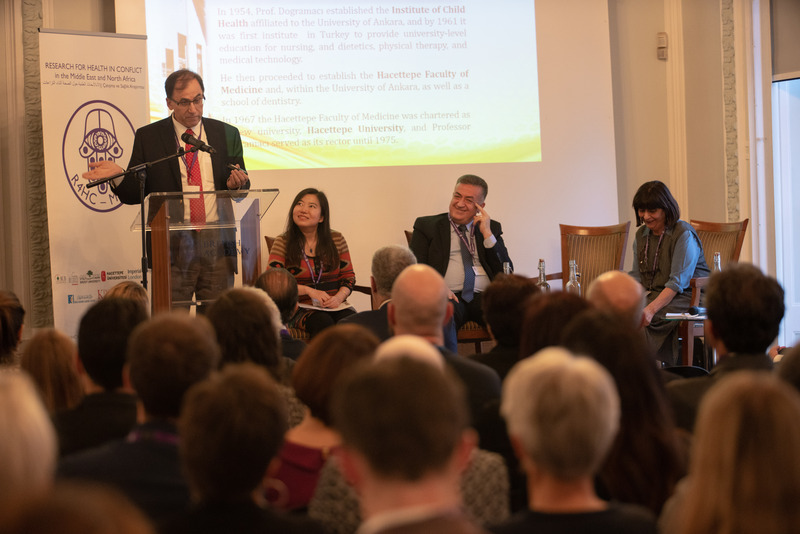 He expressed powerfully his hope that robust partnerships, as demonstrated by R4HC, can assist in delivering a clear understanding of NCDs and health care more widely in the region in an effort to generate change through the translation of knowledge into policy and practice. R4HC-MENA members then discussed the reasons they chose to become involved with the programme and what this partnership has meant for them. Dr Ping Guo (KCL) shared her experiences as a Research Associate with R4HC, describing how the programme has enlightened the minds of the early career researchers involved to further develop their own skills and abilities in a collaborative environment, while creating a new community to jointly achieve significant impact in the region. 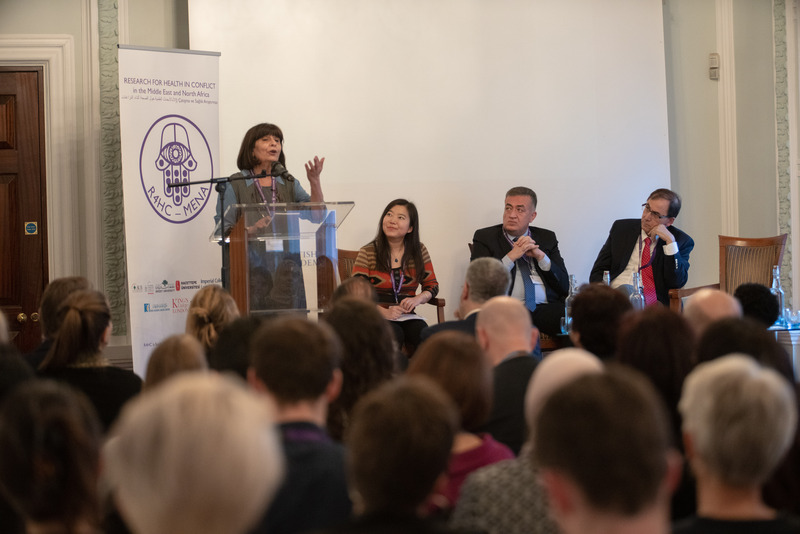 R4HC-MENA Co-Chair Professor Rita Giacaman from Birzeit University in the Occupied Palestinian Territory shared her experiences of living in conflict afflicted conditions and focused on the invisible effects of war. 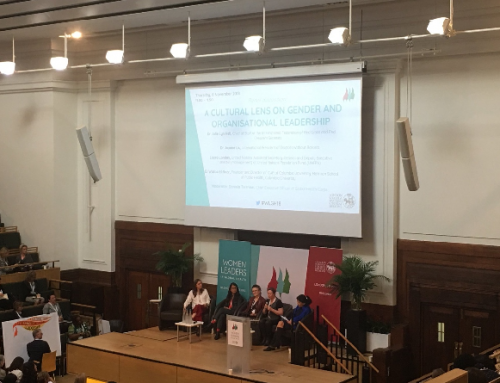 She further emphasised one of the key aspirations of R4HC-MENA: individuals from different backgrounds recognising their differences and working together. 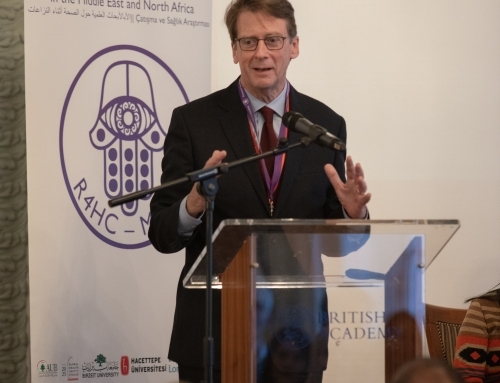 This powerful message of joint working – and joint leadership – clearly resonated with R4HC-MENA members in the room. Professor Tezer Kutluk, R4HC-MENA’s lead investigator in Turkey introduced the work of Hacettepe University (Ankara) and the importance of its partnership with R4HC-MENA in tackling common health problems in the region together. Research capacity is growing in Turkey and this partnership enables knowledge and understanding of key NCDs to be significantly strengthened. For further information visit our website www.r4hc-mena.org and follow us on Twitter @r4hcmena. Why conflict and health? Two billion people live in areas of conflict and fragility, reflecting a rapid increase in wars, ethnic strife and other man-made disasters since 2010. 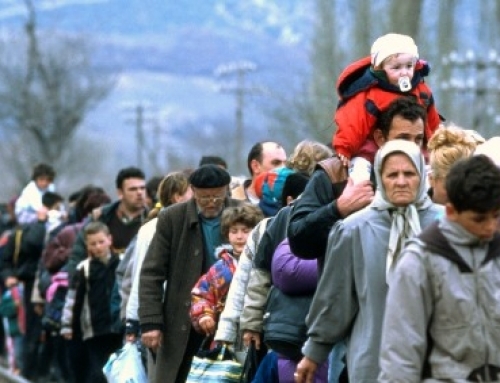 The world is also experiencing the greatest refugee crisis since WWII with 65.3 million forcibly displaced persons, 40.8 million internally displaced persons (IDPs), 21.3 million refugees and a further 10 million stateless people. Across the Middle East and North Africa (MENA) region protracted conflicts have led to dramatic increases of refugee populations in Turkey, Lebanon, the Occupied Palestinian Territories and Jordan. 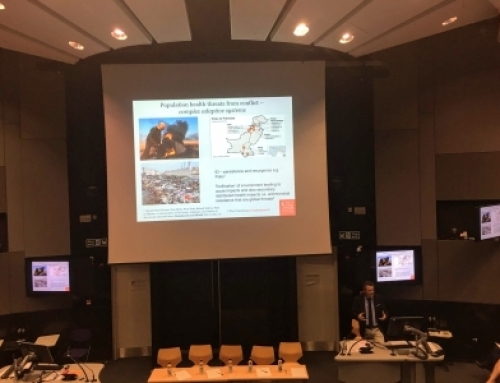 War affected populations from countries that have undergone the epidemiological transition present new health, social care and development challenges. In particular, the diagnosis, management and treatment of non-communicable diseases (NCDs) provide new challenges for domestic health systems as well as for humanitarian and development aid providers. These challenges also threaten domestic health commitments to Universal Health Coverage (UHC) and the Sustainable Development Goals (SDGs). This new humanitarian-development-health nexus demands a unique research agenda radically different to traditional approaches that address challenges posed by conflict and health in low-income countries with weak governments, institutions and a mainly communicable disease burden.